View of one of the ruined transepts at Roche Abbey in Yorkshire. This was founded by Cistercian monks from Newminster Abbey in Northumberland in c.1147 and the church and main buildings were finished by the end of the 12th century. Like most Cistercian Abbeys, it was sited in a particularly inaccessible spot, this time surrounded by limestone cliffs. After its dissolution it was used as a quarry for its stone, lead and timber. 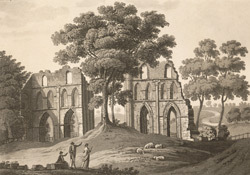 In 1755 the owner of the site, Lord Scarborough engaged Lancelot Brown to improve the site and make it into a garden ruin. In order to achieve a picturesque effect, Brown controversially dismantled some of the remaining buildings leaving only the two transepts for a romantic effect. He terraced and turfed the area, too. The ruins of the transepts are still architecturally important as an example of the French influenced early Gothic style.